This week is National Eczema Week (10th to 18th September), a week that aims to raise the awareness of eczema, as well as working to provide support and advice for sufferers. Eczema affects approximately 6 million people in the UK, including an incredible 20% of the babies in the first year of their life. It can be a really distressing experience for sufferers regardless of their age, with painful cracking of the skin, unbearable itching, and inflammation. There is no cure, but the condition can be managed effectively with emollient creams that restore moisture to extremely dry skin. 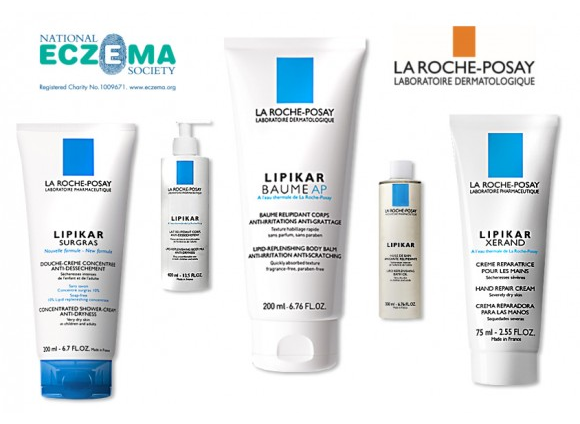 The replenishment of hydration and suppleness is one of the most important ways that eczema can be soothed, and the La Roche-Posay Lipikar Baume AP is a 24hr lipid-replenishing body balm that cocoons the body in relieving comfort. Its Niacinamide enriched anti-scratch formula helps to break the vicious cycle of itching, and its rich, compensating texture creates a barrier on the skin that protects it from external aggessors. It is perfect for dry, very dry, and atopic skin, is fragrance-free and paraben-free, and is quickly absorbed. Shea Butter restores the skin’s comfort, glycerine hydrates the skin, canola oil acts as an anti-inflammatory, and glycine soothes the skin. Other products in the range include cleansing oils, moisturising body washes, a hand cream and lightweight body milks. Visit Eczema.org for more information about National Eczema Week, and to find help and advice about managing the condition. Best on the market! Really does a great job. A friend recommended it and gave me a tube, and that's years ago. I use it regularly and it prevents infected cellulitis in my legs. I use it instead of my Dr.-prescribed cream which is based on by-products of the petroleum industry and therefore creates problems of its own. This entry was posted on Thursday, September 15th, 2011 at 10:01 am and is filed under Shopping Guides, Skincare, Skincare. You can follow any responses to this entry through the RSS 2.0 feed. You can skip to the end and leave a response. Pinging is currently not allowed.